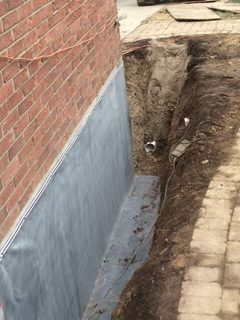 French Drains – Tischbein Co. Inc.
“French drains” are one of the most widely misunderstood and incorrectly installed drainage solutions available today. 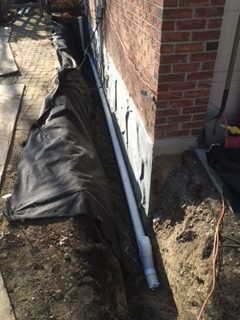 The purpose of a “French Drain” is to help eliminate standing water after a rain and/or to collect sub-surface water and discharge that water to day light or a storm sewer. 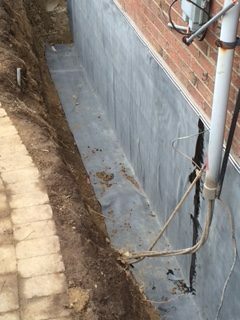 Location and design are the keys to a properly functioning French drain. If not designed and installed properly a French drain will quickly fail and may make the problem worse. 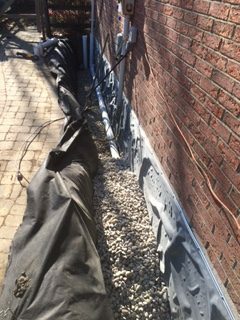 When designed properly a “French Drain” should consist of a trench, lined with geo-textile fabric, which in most cases should have a rigid perforated drain tile pipe in the bottom (not black perforated flex pipe) with 1” washed gravel on top. The trench can be left open with 1” gravel exposed, or the trench can be topped with a little soil, seed, and straw, oversized stone, mulch, sod, or a stone or gravel path can be installed over top.